Standards & Certifications | [All Things Tanning] For Tan Fans! Ecocert was the very first certification body to develop standards for “natural and organic cosmetics”. Introduced in 2003, the specification was drawn up in conjunction with all stakeholders in the value chain, i.e. experts, suppliers, manufacturers, distributors, consumers and development organisations. 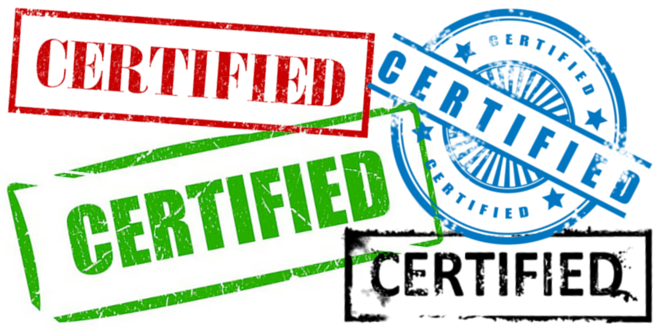 Ecocert currently supports and guides more than 1,000 companies through their certification processes. The absence of GMO, parabens, phenoxyethanol, nanoparticles, silicon, PEG, synthetic perfumes and dyes, animal-derived ingredients (unless naturally produced by them: milk, honey, etc). For the natural and organic cosmetic label – A minimum of 95% of all plant-based ingredients in the formula and a minimum of 10% of all ingredients by weight must come from organic farming. For the natural cosmetic label – A minimum of 50% of all plant-based ingredients in the formula and a minimum of 5% of all ingredients by weight must come from organic farming. NOTE: Some ingredients very frequently found in cosmetics (water, salts, minerals) cannot be certified as organic because they are not sourced from farming. For example, shampoos and some creams, mostly composed of water, contain between 10% and 40% organic ingredients, and always 95% natural ingredients. An essential oil, which does not contain water, can be up to 100% organic ingredients. IMPORTANT CLARIFICATION: Ecocert does NOT certify “organic” DHA (Dihydroxyacetone). PETA focuses its attention on the four areas in which the largest numbers of animals suffer the most intensely for the longest periods of time; on factory farms, in the clothing trade, in laboratories, and in the entertainment industry. We also work on a variety of other issues, including the cruel killing of beavers (US), birds, and other ‘pests’ as well as cruelty to domesticated animals. By purchasing only cruelty-free products, you can help save rabbits, mice, guinea pigs, rats, and other animals from excruciating tests and a lifetime of suffering. But how do you know which companies and products are cruelty-free? PETA’s Beauty Without Bunnies program is the ultimate resource for conscientious shoppers, making the quest for cruelty-free products as easy as (vegan) pie. With their searchable online database, you can search by company name or product type to learn which products are cruelty-free. And when you’re out shopping, look for PETA’s cruelty-free bunny logo – products proudly displaying this logo are cruelty-free, meaning that they were produced without testing on animals.